Nations of the earth. No-one behind. She’s passed. Then and not till then. Tram kran kran kran. Good oppor. Coming. Krandlkrankran. I’m sure it’s the burgund. Yes. One, two. Let my epitaph be. Kraaaaaa. Written. I have. Ulysses is suffused with the senses of Dublin. In particular the sense of smell, as noted by Joyce in this particular exchange with his friend Arthur Power. What is the first thing that you notice about a country when you arrive in it? Its odour, which is the gauge of its civilisation, and it is that odour which percolates into its literature. Just as Rabelais smells of the Spain of its time, so Ulysses smells of the Dublin of my day. –It certainly has an effluvium, I agreed. –Yes, it smells of the Anna Liffey, smiled Joyce, not always a very sweet smell perhaps, but distinctive all the same. The sounds and smells of Dublin in 1904 would have been very different to those of 2015. 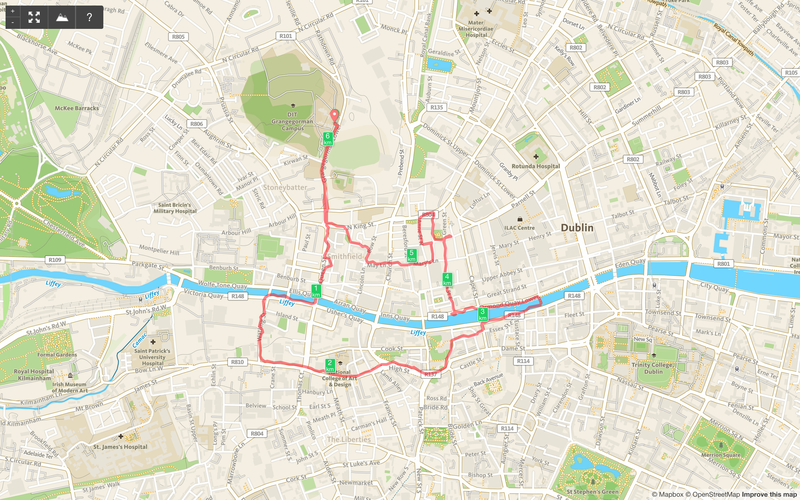 I decided to run around areas of Dublin with strong associations of smell, Guinness’s Brewery, The Liffey, The Fruit and Vegetable Markets. The brewery smells much less than it ever used to, the all pervasive smell of roasting hops seemingly reduced by modern brewing techniques. The Liffey at full tide was refreshingly odour free, as it was at low tide when I passed the day before. It was a hot summers day but the smell was much improved from the description in the Bagatelle song from 1980 I remember the summer in Dublin and the Liffey as it stank like hell… I ran along Wellington Quay where the River Poddle emerges under the quay wall. In her book The Buildings of Ireland, Dublin, (page 316) Christine Casey points out an error in the Wandering Rocks episode of Ulysses where Joyce says that the Poddle emerges from Wood Quay Wall. Regardless of where the Poddle entered the Liffey, it must have stank as much as Bagatelle noted in 1980. From its sluice in Wood quay wall under Tom Devan’s office Poddle river hung out in fealty a tongue of liquid sewage. I then ran along Ormond Quay past the point where Bloom exits the Ormond Hotel and ran up to Barney Kiernan’s pub along Arran Street East, crossing the tram tracks at Mary’s Abbey and Chancery Street. In the quote from Ulysses that opens this blogpost, Bloom is using the noise of a passing tram to disguise his flatulence, caused he thinks, by the Burgundy he had earlier in Davy Byrne’s public house. In 1904 trams ran along Ormond Quay, whereas today the Luas runs further North, behind the quays. As I ran up towards Barney Kiernan’s pub I ran in and around the markets area, in particular the CIty Wholesale Fruit and Vegetable Markets, a much more pleasant and odorous experience.